Breast hamartoma: Is this an uncommon or an under-recognised lesion? A hamartoma is a disorganised focus of a mature overgrowth of cells composed of tissue elements of the organ in which it is found, and it can occur anywhere in the body. A breast hamartoma is a rare, benign tumour consisting of fat, glandular and fibrous tissue, and is known by various names such as lipofibroadenoma or fibroadenolipoma, depending on the dominant tissue found within the lesion. The reported incidence is low (0.1% - 0.7%), but is increasingly thought to be because of under-diagnosis of the condition. Breast hamartomas are uncommon lesions with a low incidence, according to the literature, but this may also be the result of under-diagnosis. The reported incidence in the literature is between 0.1% and 0.7%, as described by Arrigoni et al. in 1971.1 The lesion is known by several names: fibroadenolipoma, lipofibrodenoma or adenolipoma.2 Clinically, it is a painless, smooth, mobile breast lump that may or may not be palpable and can slowly enlarge in size.3 Radiologically, small lesions may appear as normal breast tissue but larger lesions tend to develop a characteristic appearance. We describe a case of hamartoma of the breast with typical radiological features that allow a diagnosis to be made without biopsy. A 38-year-old woman presented with a palpable, soft, mobile, non-tender breast lump in the supra-areola region of the right breast. On enquiry, she revealed that it had been present at her previous ultrasound performed at another practice and had not changed in size or consistency in the last 12 months. The patient had been informed by the radiologist at the time that it was a rare type of benign fatty tumour that should not cause any concern. 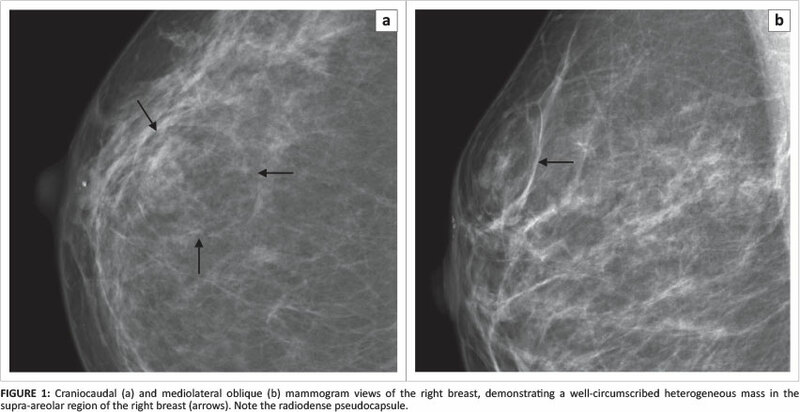 The mammogram demonstrated a well-circumscribed lesion in the right breast supra-areolar region, with a heterogeneous density and a thin uniform radiodense pseudocapsule (Figure 1). 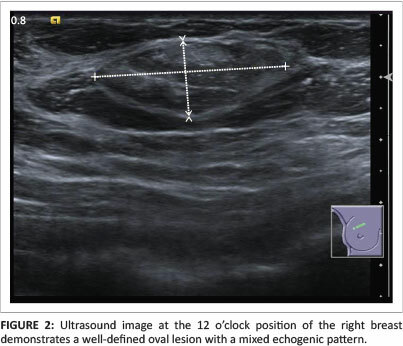 On ultrasound, a well-circumscribed breast lesion was noted in the 12 o'clock position that demonstrated a mixed echogenic pattern with a predominant echogenic pattern consistent with fat (Figure 2). In comparison with the previous ultrasound study, as indicated on the report, the lesion had not changed in size or character significantly. After consultation and discussion with the patient, no further management other than regular self-examinations and follow-up breast screening was recommended. The patient was advised to seek immediate attention, however, if any change in the size or nature of the lesion was detected. Some articles in the literature3,4 describe the presence of coexistent malignancy in a small percentage of hamartomas whilst others indicate that there may be a low risk of malignant transformation. Patient education regarding the importance of self-examination and compliance with follow-up must therefore be emphasised, and the radiologist should always be vigilant about any small change within the tumour. Regarding definitive diagnosis of a breast hamartoma, views differ. Most advocate that fine-needle aspiration (FNA) or core biopsy has a limited role, and recommend full excision biopsy for a better diagnosis. If a biopsy is not done, then regular clinical and radiological follow-up is recommended. Breast hamartomas are rare benign breast tumours that, whilst having characteristic radiological findings, do not possess definitive histological features and can often be reported as normal breast tissue. It is therefore important to have good clinical, radiological and histological correlation to avoid under-diagnosing such lesions.6 If a biopsy is going to be performed, excision biopsy is recommended rather than FNA or core biopsy. With the increasing practice of mammographic breast screening, it is important for the radiologist to be aware of this tumour and to pay attention to the clinical information and good radiological correlation.